Start by preheating oven to 375 degrees. Generously spray regular sized nonstick muffin tin with nonstick cooking spray. In a large skillet, cook bacon about five minutes total, just until fat has started to render and bacon is still very soft. Divide Thomas English Muffins and roll flat with a rolling pin until thin and flexible. Carefully line muffin tin with english muffins. Brush english muffins with melted butter. Sprinkle a small amount of cheddar cheese in bottom of each muffin. Cut bacon slice in half and lay each half into muffin. Push everything down firmly so there is plenty of room for egg. Crack egg into each muffin. Bake english muffins for about 20 minutes just until egg white is set. Remove from oven and sprinkle with fresh chives. 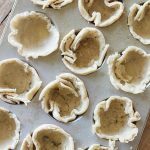 Remove english muffins cups from muffin tin while still warm to prevent sticking.